GlaxoSmithKline (GSK) used to operate a manual sterile filtration system at its manufacturing facility in Ulverston, in the UK. This was used to transfer product into a Grade C cleanroom. 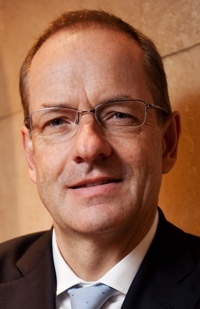 The pharmaceutical giant, however, recognised that a more automated solution was required. The company put together an award-winning team to design and commission the project. A crew from Suncombe, the critical processing specialist, joined the project. Typically, filter integrity testing involves a number of manual operations and relies on a path to the atmosphere to test integrity. 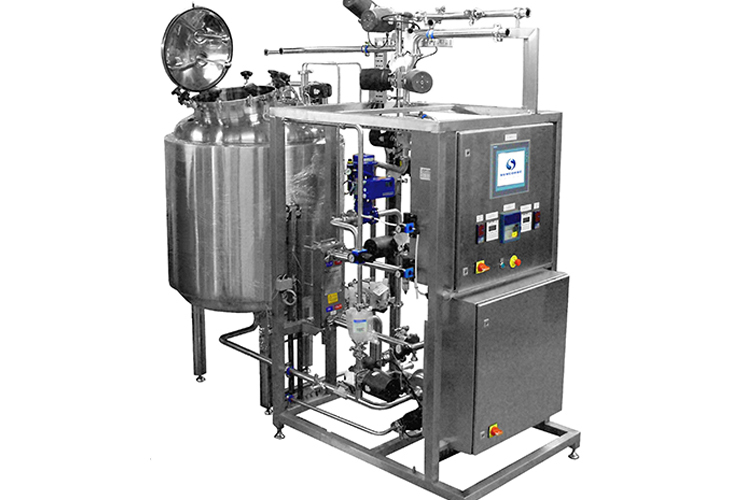 The GSK setup consisted of two filters and interchangeable hose connections, which were operated manually. This configuration did not protect the sterile nature of the filtration system, as exposure to the environment was inevitable during operation. GSK's facility required a new system that was fully integrated and completely automated while being capable of protecting the sterile boundary during filter integrity testing. 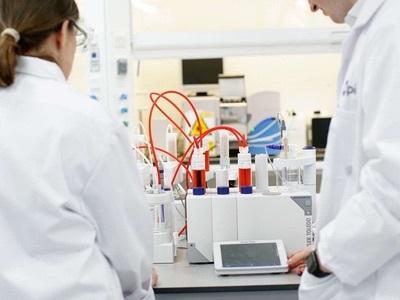 For GSK, the challenge was to design and build an automated sterile filtration skid with hard-piped, integrated integrity testing, and no potential routes for contamination during post-sterilisation, integrity testing, and pre-use. Only the change of the filter element would remain as a manual operation. 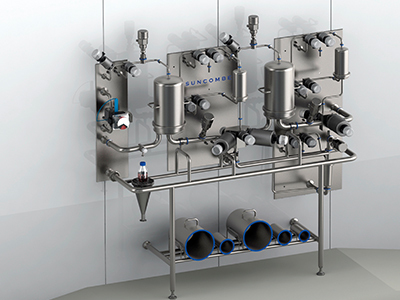 Suncombe, GSK and ITT Engineered Valves worked on the design of the filtration skid. During the design sessions, the team discussed system requirements and constraints. Using a piping and instrumentation diagram (P&ID), they examined slopes, dead-legs (where fluid can become stagnant) and overall height so that all aseptic design criteria were met. The design had to allow for off-site fabrication, testing and validation to reduce construction activities. Having been chosen as the preferred mechanical design team and fabricator, Suncombe attended the initial meeting to kick-off of the project. Rather than a typical ‘meet-and-greet’, the working session involved all keystakeholders and major equipment manufacturers, allowing for meaningful design discussion from day one. Once the P&ID had been constructed, reviewed and approved by all parties, a detailed 3D design started. Weekly meetings, regular and frequent teleconferences, and mutual site visits allowed monitoring the progress of the project closely. 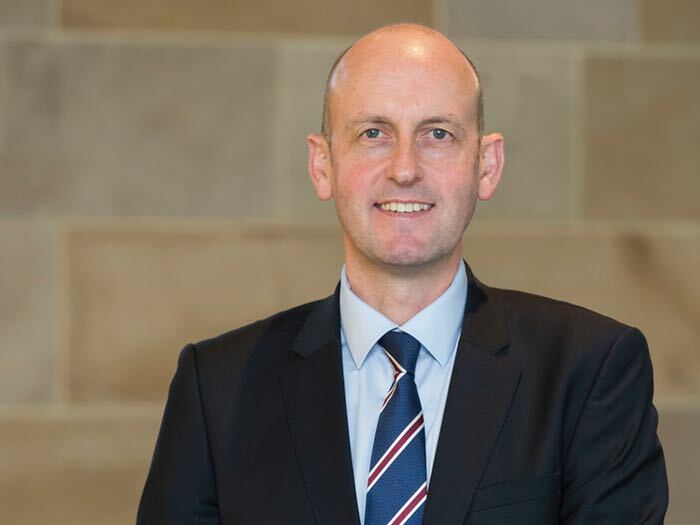 Feedback from all parties could be incorporated as appropriate. The collaborative work ensured that all elements of the proposed system satisfied the design intent. Over a number of iterations, a final design evolved incorporating compliant line gradients, minimised line dead-legs and millimetretolerances over the entire system. Over a period of six months, a system was developed. It comprised of over 70 valves, including multiple mono-block valves, to allow repeatable inlet/outlet configurations for maximum compatibility as well as optimising the efficiency of the process and reducing the resources required to produce a batch. 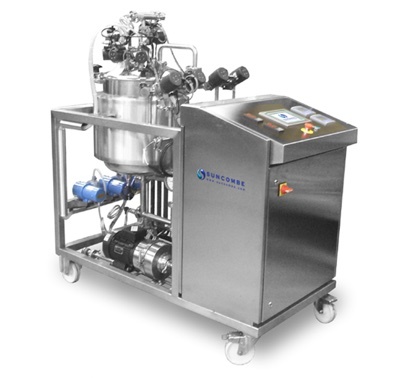 The skid permitted dual filtration by having each filter connected via permanent pipework to the integrity tester. This was designed to be connected to by a plant control system. Any open ends were protected by additional filter units (which can also be integrity tested), or by a flow-controlling operational pressure regime. 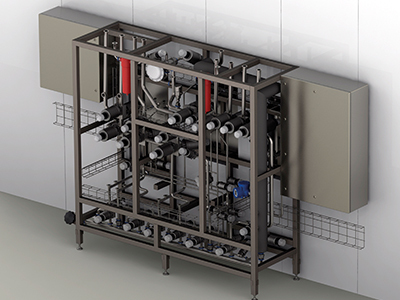 The filtration skid was designed to integrate with a cleanroom, but keep a majority of the valves in a technical area outside that environment. As the system is fully automated, this allows the plant control system to utilise 55 different operating sequences. Due to the complete integration with the cleanroom walling system, a degree of flexibility of positioning was required while maintaining a hygienic barrier between the ‘clean’ point-of-use equipment and the technical area (i.e. valves/pipework/etc.) behind the walling. Manual operation is limited to essential procedures such as filter changes. The unit allows for multiple inlets (multiple process streams as well as pure steam, WFI, compressed air, N2) and multiple outlets to a number of production vessels. Also, the design had to meet several regulatory requirements: ATEX (as solvents are being filtered); ASME BPE; and current GEP practices with regards to safety (process and operational safety). 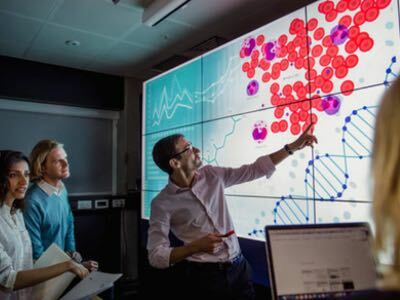 Looking back at the realisation of this project, Suncombe was delighted to be part of the team for this project within GSK. 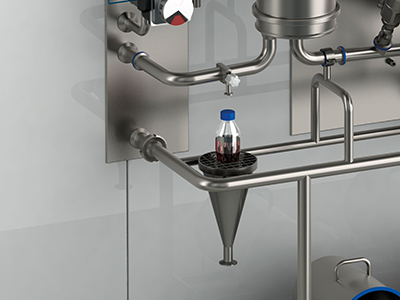 Using our 50+ years of experience of producing hygienic pharmaceutical systems, and working with the company, PM Group and ITT, the team delivered a state-of-the-art system. The project provided great challenges for the whole team, and I am proud to say that these challenges were met and exceeded. 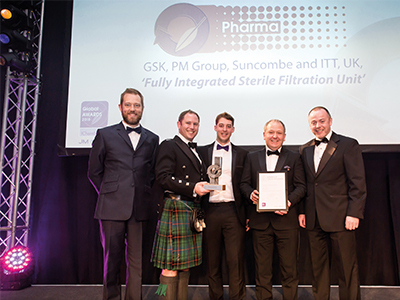 Suncombe, alongside the GSK's partners in this project, was recognised in the IChemE Global Awards as the team took home the Pharma category. 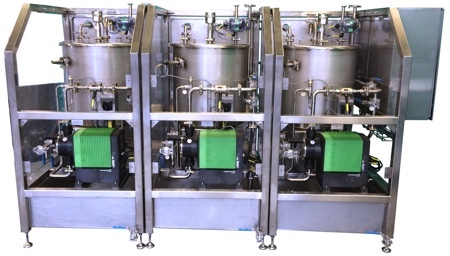 As well as reducing risks within the production process and enhancing the ability of the facility to maintain production and quality, the design and automation of the filter skids will allow the operation of the process stream to be optimised. This will improve the overall efficiency and cost-effectiveness of the process. In addition, operational safety will be greatly enhanced, with full containment of harmful fluids and gases and almost complete removal of manual operations. From an environmental perspective, and because the process will be improved, optimised and made more efficient, the volumes of processing fluids/utilities required will be reduced; thus the volumes of effluent and waste. Ultimately, the solution lowers the site's overall energy and utility resource requirements. 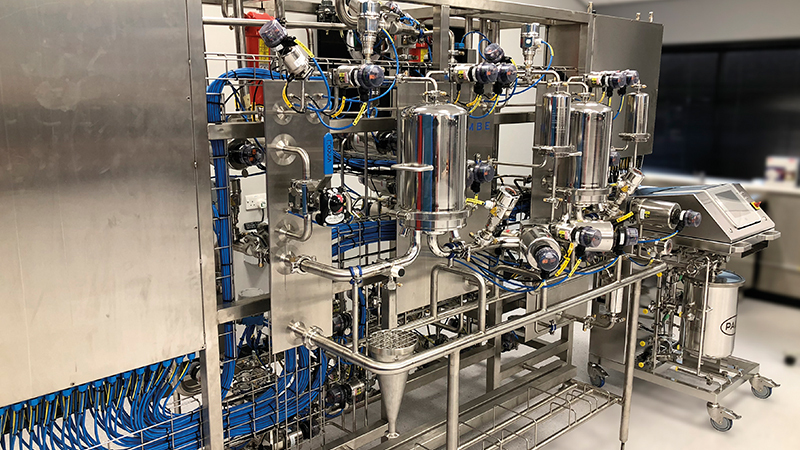 Because the filter system will be used in a sterile manufacturing environment, this design will enable the GSK’s Ulverston site to maintain the highest standard of product to its patients, while providing its staff with a greatly improved manufacturing environment. N.B. 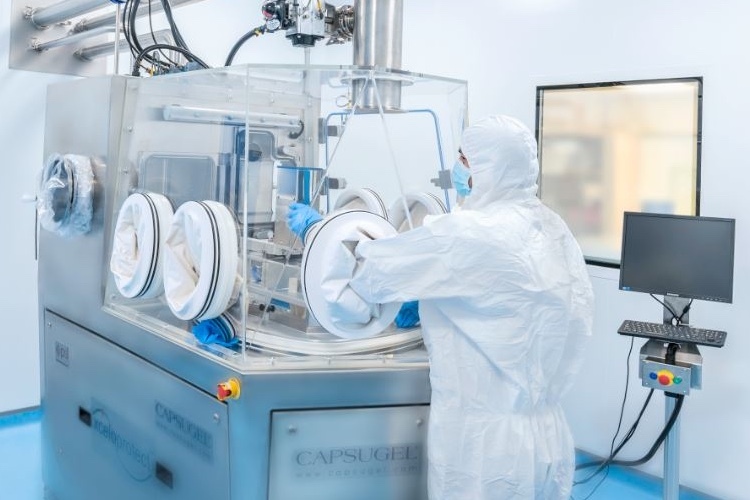 This article is featured in the February 2019 issue of Cleanroom Technology. The digital edition is available online.